I have been making marinara from fresh tomatoes for a long time. The first time I tried it, I was hooked. It tastes so much better than versions I had tried before from canned tomatoes. But I’ve also learned a few other important lessons: The first was when I roasted my tomatoes first, they were much sweeter and it reduced the cooking time significantly because much of the water cooks off during roasting. So I could have a nice thick sauce without it spending hours on the stove reducing. The second was that it didn’t take much longer to make a big batch than it did to make marinara for one meal. When I made a a big batch and stored some from later meals, those meals went on the table really fast. And I had to wash far fewer dishes. I hate washing dishes. Really, I hate it. The third lesson was that I could use marinara as… well, marinara. Or I could add meat later for a heartier meal. Or I could use the thick sauce as the base for lasagna. Or I could use it to trick my kids in to eating spaghetti squash. (Please don’t tell them spaghetti squash is a vegetable. They currently believe it is sweet pasta. I am totally okay with them believing a lie.) 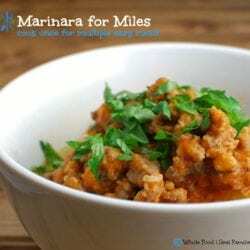 Check out the picture with this article for Spaghetti Squash with Ground Sausage and Marinara. We love our Farmers’ Market and our local farmers. It is truly a different and wonderful experience to get closer to your food and the people who know the food rather than how to market it to you – it is a totally different perspective. I feel smarter about what my family eats because I have had so many wonderful people share their knowledge with me. (Whether I am smarter may be up for debate – but I FEEL smarter!) Thankfully, they don’t sell a lot of canned goods at our market so food from the Farmer’s Market is perishable (thank goodness!!). We have a vested interest in making sure the food we purchase goes to a good home – our bellies! And not the trash can because it spoiled. If you have ever put up your own fruits and vegetables, you know this. It tastes so much better. Picked fully-developed and fully-ripened, cooked and preserved carefully. There really is nothing better than opening food you put up yourself – eating fresh tasting peaches in December, having tomatoes on standby that don’t taste like the can they came in, making pumpkin pie in April because it is your favorite. Try it and you will never, ever want to eat out of a grocery store can again. It is far less expensive to buy organic produce in bulk from the Farmers’ Market than it is to buy from the grocery store. I have mixed feelings when I read articles that advise people to negotiate prices at the Farmers’ Market. On the one hand I get it – we don’t have a bottomless bank account either. I like to make the money I spend count. On the other hand I find it embarrassing, almost offensive, to see people negotiating over 3 or 4 items with a $5 cup of coffee in their hand. Generally, I ask the question, “how much for a whole box?” I think it is a reasonable, respectful question. There is usually a per piece or per unit price listed – so the volume I am requesting is different enough that I feel comfortable asking for the bulk price both as a cost savings opportunity and as a convenience issue. I doubt the farmer really wants me rambling through boxes of produce counting pieces while other people are shopping too. Generally, I receive a significantly reduced price for buying in bulk. It makes me feel proud of myself. It just does. Don’t judge me. In the recipe below, I make reference to allowing enough head space when freezing in glass versus freezer bags. If you are interested in learning how much head space you need when freezing in jars, check here. Or if you just feel inspired and want to go buy 100 pounds of tomatoes to preserve today and don’t have the freezer space, learn about pressure canning tomato products, check here. Neither freezing or canning is particularly hard. Freezing is faster, canning is more convenient if you don’t have a lot of freezer space. Cook once, eat lots. 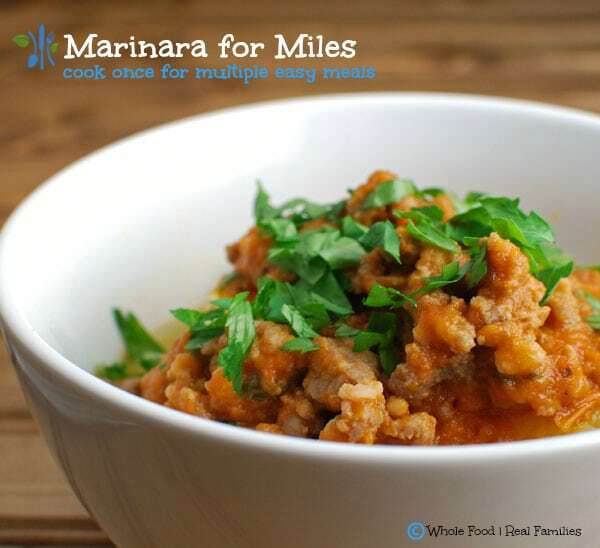 Marinara is great on pasta just like it is - but you can add meat later for a heartier dinner - or use in many different recipes for a tasty, nutritional kick. Don't buy the canned stuff! Make you own in bulk and keep in on hand! This recipe will feed my family approximately 8 meals, assuming around 2.5 cups of sauce per meal. The actual yield will fluctuate some based on the type of tomatoes, water content, etc. Though the cooking time is listed at 90 minutes, most of the cooking time is passive time. 3-4 large red onions, diced You can substitute any sweet onion variety! We love Vidalia Onions too! 25-30 lbs fresh tomatoes, roasted Pounds are before roasting. Roasting will remove much of the water and seeds so it will weigh significantly less for this recipe. Drizzle olive oil in the bottom of the largest stock pot or Dutch oven that you have. This recipe is going to take some space! Heat oil over medium-low heat. Add butter to pan and allow it to melt in the oil. Add red onions, salt and pepper them to taste, and allow them to caramelize in the oil and butter. This takes a little while, you want the onions to loose some of their bite and taste sweet. If they are sizzling or browning, they are cooking too fast, turn them down and let them cook, stirring occasionally for 35-45 minutes. Don't panic - this part takes as long as the rest of the recipe put together. Once onions are caramelized, raise heat to medium. Add garlic and let it cook with the onions for about a minute, or until the garlic becomes fragrant. Add previously roasted tomatoes, with their skins removed. I pull them apart with my fingers as I add them to the pot. You can certainly substitute organic tomatoes from a BPA-free can here - but fresh tomatoes that have been roasted in the oven are so sweet, once you try it you will never want them out of a can again. Stir to combine. Add finely chopped, fresh basil. Don't skimp on the basil. The fresh flavor makes a world of difference in the end result. Add dried oregano - I actually don't mind dried oregano over fresh because oregano can be pungent when fresh. If you have fresh oregano and prefer it, I would start with 4 tablespoons of fresh and add 1-2 tablespoons more by taste. (the general rule of dried versus fresh herbs is 1:3. I prefer to be a little conservative with oregano so it does not become overpowering.) Add red pepper flakes. Salt and pepper the sauce to taste. Allow it to cook for 20 minutes at a low simmer, stirring occasionally. Use your immersion blender to puree the sauce to your desired consistency. I like mine to be blended but still chunky. Because the tomatoes have been roasted previously, much of the water will have cooked out of them so your sauce will not have to reduce. It will be thick. YUM! Make sure to taste your sauce and adjust seasonings based on your preference. Allow the sauce to cool and freeze it in freezer bags or freezer-safe glass containers. If you choose to freeze in glass, make sure you leave the appropriate amount of head space in your jars. Food expands when cooking, which can cause glass to break. If you freeze in freezer bags, freeze them laying flat. Once frozen, you can stand them up and it will take much less room in your freezer. If you are interested in canning your sauce for the pantry (because there is only so much room in the freezer! ), make sure you check with your local Extension Service or the National Center for Home Food Preservation for advice on waterbath versus pressure canning tomato based recipes.